Keeping a basement completely dry is always a challenge — especially in areas where they sit below the groundwater level. It’s imperative to have a reliable sump pump to keep excess water out of your house, protecting it from the dangers of mold and mildew growth. Sump pump pits are dug in the lowest part of a basement or crawl space, and the pump is placed inside. If water fills the pit, a sensor turns on the pump, which then pumps water out of your house. Your sump pump is an important line of defense during storms and heavy rain. If it fails, you could suffer water damage which is an expensive and time consuming repair. POWER FAILURE: Installing a battery backup or backup generator is the best way to keep your sump pump working during a power failure. WRONG SIZE: Having the right size pump installed for the size of your house is another important consideration, and it’s a good idea to include an alarm that lets you know when the water has exceeded the level your pump can handle. INSTALLATION: Having your sump pump installed properly by a certified plumber is crucial. Manufacturer’s guidelines must be followed, or backflow of water can cause the pump to malfunction. MAINTENANCE: Regular maintenance makes sure the power backup works, the pump is discharging water properly, the float is operating properly and that nothing is clogged in the discharge line. SWITCH MALFUNCTION: If the sump pump pit is in dirt or gravel instead of concrete, debris can get into the pump and interfere with the float and power switch. There may be times that a sump pump simply fails to operate during a storm. 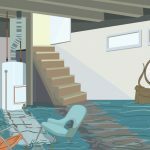 Depending on the amount of flooding that happens, here are some recommendations for getting that water out of your basement or crawlspace. A 5 or 10 gallon wet/dry vacuum can handle most bigger water amounts. Remember to dump the water you collect at least 20 feet from your house. If there’s more serious flooding, you might need a trash-water pump which can pump out thousands of gallons of water per hour, including soft solids like mud, sand, and sludge. In both of these scenarios, it’s important to get the water out as soon as possible to reduce the extent of the water’s damage to your home. It’s recommended that you replace any drywall and carpeting that was affected. Your local health department can also provide information on what you can do to further reduce the risk of mold growth. Sump pumps are crucial for any basement or crawlspace that’s at risk for excessive moisture or flooding. Having the proper size sump pump, properly installed with a battery or gas generator backup is your best bet in most situations. 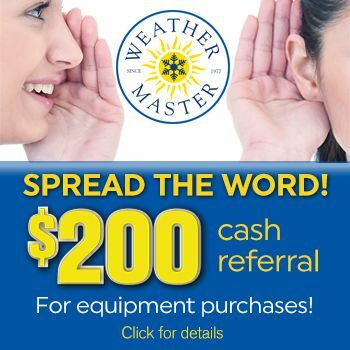 When you need to install, fix, or maintain a sump pump in the Raleigh, North Carolina area, contact Weather Master’s Mr. Plumber to advise you on the right equipment for your needs. You can also text us at (919) 752-4999 to schedule your next appointment!